Last week, we finally got to visit my mom at her house for the first time this summer. It seems that mom is always making the journey to our house (which is much easier on our kiddos). We had such a good time. 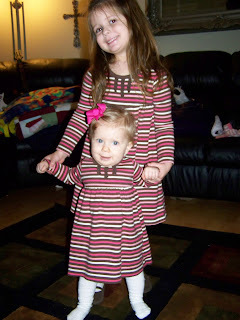 Addison loved exploring (destroying) Nana's house and Avery had fun getting out jewelry and playing dress up! 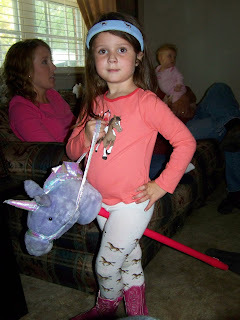 Following in her big sis' foot steps, Addison watched Avery for a few minutes on this magical unicorn and then gave it a go herself. 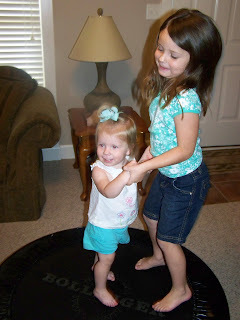 Both of the girls love jumping on Nana's trampoline! I jumped on it when I was younger! 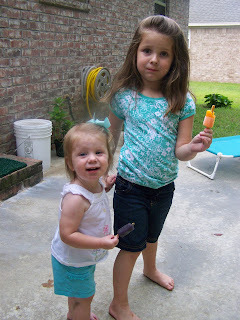 We love popsicles in the summer! I think Addison had a brain freeze! I'm following orders given this morning and updating our blog! I know, I know! I SHOULD have all this extra time on my hands since it's summer. Right! I'm taking naps this summer and didn't last. It's an age defying thing. 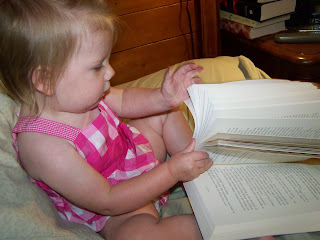 ANWAY, our little Addison has become quite the "reader." Maybe a better term for it is "book getter." She's always let me read to her, but this past week, she began bringing me books and crawling into my lap. LOVE IT! Most of the time, she will wait patiently for short books. If I tend to get long winded, she's outta there. 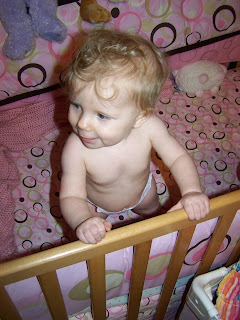 I was letting her crawl around on my bed the other day and what did she find? A Twilight book! She's got good taste in books! It seems like just yesterday that our little Addison (or AJ as we so lovingly refer to her) was a baby just learning to crawl. However, times have changed and our "little one" has perfected the art of walking and baby running and is now on to more difficult tasks . . . CLIMBING! If there is something that she can hoist herself up on, she is climbing to the highest point possible. 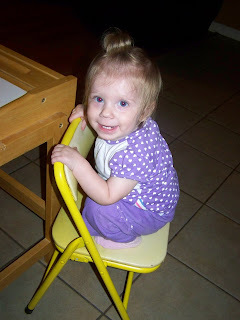 She loves getting into her big sister's folding chair, placing it by the couch and climbing over! We have a sectional and she practically runs on it. It makes her daddy's heart skip beats.She is so daring and it makes him so nervous! AJ just looks at us a smiles this huge grin as if to say, "I know I'm making you anxious, but this is SO FUN!" Sounds like someone is going to be like their big sister! Mommy and Daddy have years of worry ahead! Avery's Christmas wish came true! Santa brought Avery her very own pony! Actually, this has been Avery's wish for some time now. She always says, "I wish I had my very own pony." When we ask her where we would put one, she always replies, "On the deck!" With the help of our Ms. Heather, (By help, we really mean Heather did all of the work and coordination. We just fit the bill.) Avery was finally able to have a very sweet, very broken, very gentle pony named Baby. 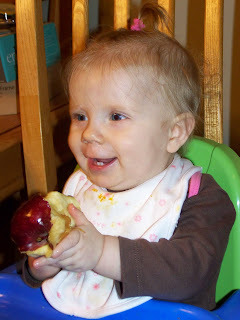 She had no idea what the apple was for that Santa left her under the tree. 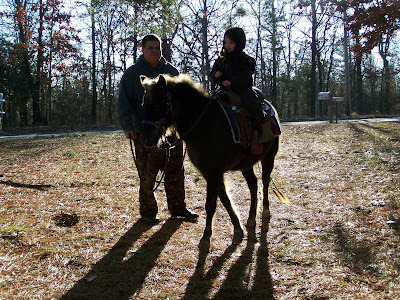 After we opened all of the presents Christmas morning, we all went outside and surprised Avery with her pony. Of course, Avery cried when Baby had to be taken to the barn to stay, but will be visiting her often. I believe Baby will be able to be in some horse shows pretty soon! 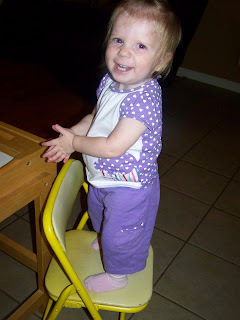 All She Wants To Do Is Stand! All Addison wants to do is stand. She still has not crawled. Eight months and as far as she has gotten is to stoop over from the sitting position and get on her tummy. Once she's there, she can scoot herself around, but doesn't want to use her knees. She also does not like spending a lot of time in this position. 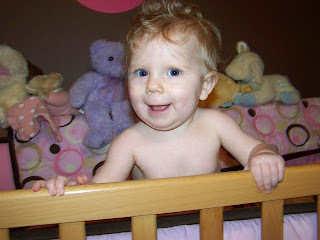 Avery crawled when she was 7 months, so once again, you can't compare children. Each one is different, even when their yours! Our beautiful, blue eyed, baby girl does love to stand in her crib, stand and hold onto the couch, cruise around in her stroller, be walked around a room with both hands holding onto someone else's, and she has even stood on her own for about 5 seconds. Where, oh where, did the "infant" time go? I feel the need to spend a little bit of time talking about my Avery. Yes, a lot of times you will see the two of us "butting heads." She is my fiercely strong-willed child with a headstrong determination to have things the way that she wants them. She is wildly creative! She loves playing dress up and telling stories about horses and princesses. As I've talked about before, she has that great balance of wanting to be outside and into everything with her daddy and then come in and dress up and be girly. She is crazy about drawing. She will erase something 20 times until she has it just the way she wants it. She is so bright and is asking me all of the time how to spell things. She has even started sounding out some words and writing them. She is extremely loving and affectionate. 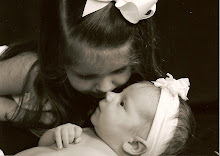 She is a wonderful big sister and is loving teaching Addison things and "reading" to her. She is so silly and her laugh is infectious. Avery has been so inquisitive about things lately. Always asking why and how. 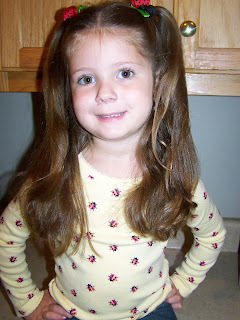 I can't believe that she is going to be in kindergarten next year. She will always be my little girl no matter how old she gets. I think of the book I'll Love You Forever, as the mother talks about holding her child in her arms no matter their age. 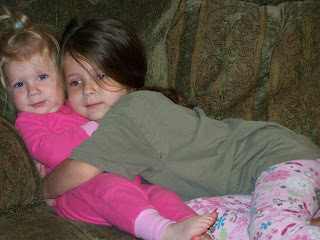 Avery often says, "Mommy, I want you to snuggle with me." As I do with my mom, still today, I hope my beautiful child will always feel drawn to come and snuggle with her mommy even when she is a mother herself. Long time, no blog. I know, I know! 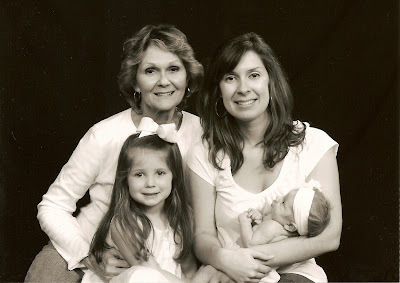 A few weeks ago, the Collins Family made the long (and I mean long with a 4 year old and a baby!) 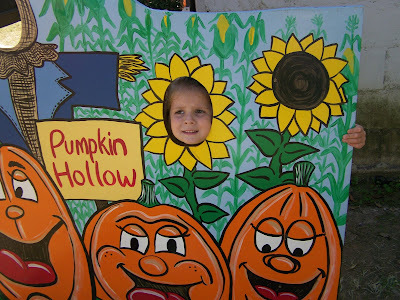 journey to St. Francis to partake in the Pumpkin Hollow experience once again. This was my 10th visit (love school field trips! ), Joe and Avery's 3rd, and Addison and Nana's 1st! It was a fabulous day and we all had a really good time. 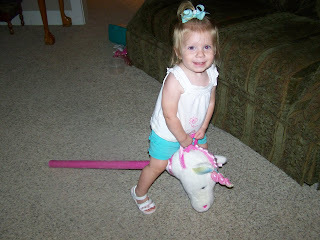 Avery, of course, was eager to ride the horses, but thought that the ride was much too short. I agree. For $5, I expected at least 5 minutes. 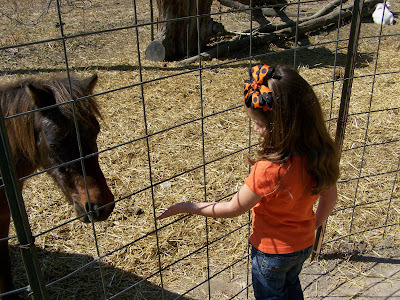 She also got to feed a miniature pony along with the goats. Addison was carried around the whole time in one of those baby papoose things. She really enjoyed it and it was easy for me too! She enjoyed watching her big sis on the little tractor "train" ride while she feasted on a big helping of carrots. My favorite part of the whole day, was watching Avery chase the pigs during the pig scramble. It's fun taking these traditional trips every year with the family. Avery is always asking me to let Addison take a bath with her. Yes, we are still using that infant sink tub. AJ (as she is called by her daddy) is almost sitting up all by herself, unless she moves slightly and then she does a nose dive. Anxious for them to be able to take a bath together and cut down on time, I finally gave in to Avery and placed Addison in the "duck tub" in the bathtub with her. I forget how slippery little babies can be. I placed her in the corner and the second her back got wet she began slipping completely down into the water. So, I'm holding her up with one hand and trying to bath her with the other, while my 4 year old is squished in a 2x2 area of bathtub with her back and head in the water and her legs hanging out over the side. Avery thought that this was so much fun and quickly realized that she had a bathtime playmate to entertain. She began throwing the rubber duck into the air to make Addison laugh. She couldn't take her eyes off of the flying duck! Of course, Addison loved the new experience and enjoyed watching the Avery show. Needless to say, we are back to the infant tub until little AJ aces the sitting test. Avery had her 4th birthday party at Jumping With Joy in Paragould. All of the kids and parents (especially Amy Reed who braved the slide with Berkley) had so much fun. Avery loved being around all of her friends and family who came to help her celebrate her big day. I can't believe our little girl has turned four. It seems like yesterday that I was . 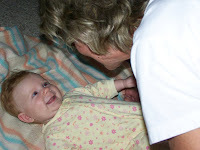 . . looking into her eyes for the first time whenever they placed her in a tightly wrapped blanket by my head in the hospital, watching her take her first steps, hearing her say "momma" for the first time, even better - hearing her say, "I love you, momma!" for the first time, watching her being so independent in her first year of preschool and now she seems so grown up. Now she is a beautiful, entertaining, dancing, horse loving, big sister, with a huge amount of determination and a very strong will who is so brave, so loving and so smart. No matter how big you are, Avery, you will ALWAYS be my little girl! I will cherish every minute of our walk together along the way! Avery's birthday is August 25th. She will be the big 4! We are so excited! 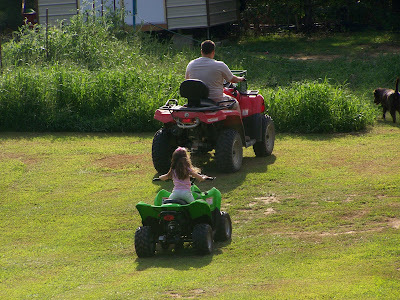 Joe has been talking about getting Avery her own four-wheeler for quite some time now. He decided a few weeks ago that her 4th birthday would be the perfect opportunity to get her one. 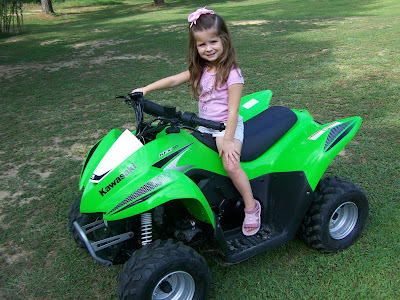 Her researched several different kinds online and finally decided on a Kawasaki 50. I was really wanting to get her a green one (they didn't have pink) so I was thrilled whenever Joe brought it home the other day and discovered I had gotten my wish. Now to see if Avery liked it. She came home from her Nana's today and Joe was chompin' at the bit to give it to her. There is no way that he could've waited until the 25th to give it to her. So, whenever we were all ready, I armed myself with the camera and we all went outside and waited for Avery to see her birthday present. As you can tell by the video (hopefully coming soon), she was pretty excited. Joe and I were so excited as we watched her eagerness to ride it and learn all about it. Of course, Joe had to tell her numerous times to slow down. I rode on the back with her which was really strange having my almost 4 year old as my chauffeur! Addison and I loved watching big sis and daddy riding four-wheelers together! Now, all we need to complete the picture is a helmet. Yes, all you safety people out there in blogger land - she will have one soon! This past weekend, our family joined Joe's parents, his brother's family, and his sister's family in Branson. Our first stop was the Dixie Stampede. Of course, Avery was thrilled to be there! She loved pointing out all the horses and telling us was kind they were. She was even chosen to do a rope trick during the show! The next day, it was off to Silver Dollar City. Avery loved riding the small roller coaster, the flying Dumbos, the underground mine, and the teacups. She did not, I repeat, did not, like the large ship that swung back and forth (neither did her daddy). Addison was such a trooper as she braved the heat in her stroller with her own personal fan. We could only handle about 4 hours of the fun in the sun. We were all very hot, worn out and ready to go (as you can see Avery is in the picture of her with the straws). Over all it was a wonderful family trip that I look forward to taking again sometime in the winter! When talking to her Nana - "Nana, I can't come and stay with you now because I am a kid and I need to stay with my mom and dad. When I am a parent, I will come and stay with you. That way, you won't be lonely." Yesterday, I had a ton of raffia laid out to use for VBS. She laid down in it with her baby doll and said, "Look, Mom! I'm Mary." Whenever she was talking to her dad on the phone while we were visiting Nana, her daddy was telling her how much he missed her and was ready for her to come home. 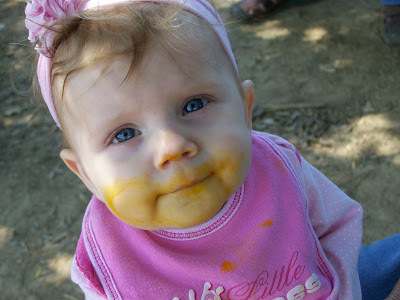 I knew that she was having fun, and although she missed her daddy, was not ready to go home. So she offered him this, "Daddy, you'll be in my heart." Recently, when her nose was stopped up she proclaimed, "Momma, I need you to pray for my nose. It's stopped up!" Whenever she talks about going and seeing Carrie Underwood she says, "Momma, I can't wait to go and see Carrie Hoodwonder!" I absolutely love this picture that I just got in (thank you Greg - we love Pinkston's)! 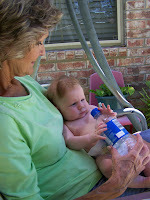 I think it is so sweet that Addison is looking at my mom. Can't wait for Avery to take her 4 year pictures in a couple of weeks. It will be so much fun! 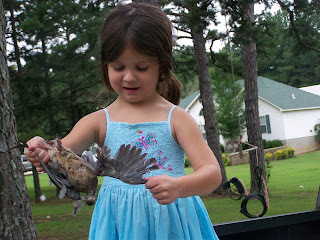 Check out the professional poser on the Cheatham Blog. 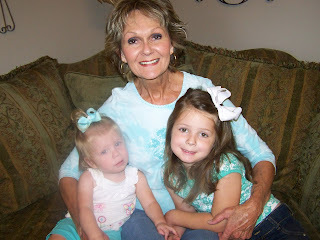 Avery, Addison and I spent the week with my mom (Nana) in Searcy. Avery loves her nana so much and was so excited to spend some time with her at her house (Nana usually comes and spends time at our house). This was Addison's first trip to Nana's so there was a lot for her to see and take in. **My mom had a large tub of dress up clothes all ready for Avery to try on. Of course, that's one of the first things that she did. 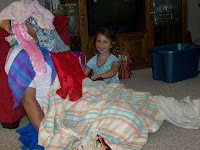 She also had fun piling all of the clothes on my mom's friend, Daniel. He sit very still as Avery covered him completely up with silk scarfs, skirts, princess clothes and dresses. Avery thought this was the neatest thing to do! 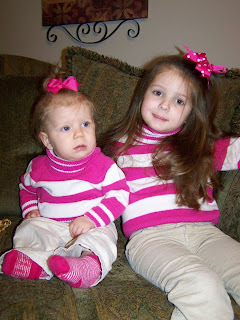 **Avery's cousin, Hailey, came over to play and the girls had a fun time posing for the camera. 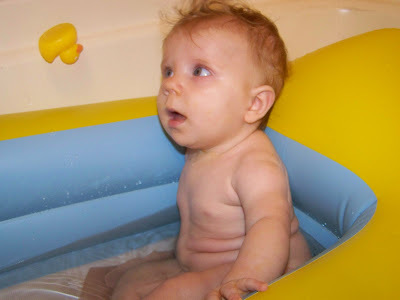 **As you know, Avery loves swimming and water, so she was very excited to put on her bathing suit and play in the little pool. She also was able to play with bubbles - giant bubbles! **I remember playing with sidewalk chalk when I was younger. I loved it! Avery does too! She had fun writing her name with different colors of chalk. **Just like at home, Addison loved swinging in Nana's swing. **I love playing Scrabble. Mom and I stayed up after the girls had gone to bed and had a friendly little game. We get pretty competitive. I have to brag on myself. Mom made the word "round" and I added a "g" to the beginning and an "s" to the end to make "grounds." The "g" and the "s" both feel on double word score so I was able to make 36 points by using only 2 letters! ***I am so blessed to have such an incredible mother. She is so extremely elegant and classy and beautiful, is always helping people - especially me with the girls, outgoing, funny, intelligent, quite the Scrabble player, a solid woman of God, and the most fabulous mother I could have ever hoped to have. I look to her as the example of what a good mother is. I pray that I will have the same close relationship with my girls, that I share with her. Mom, I truly appreciate all that you are and all that you do! 1) Addison had a terrific day and was a wonderful car rider! 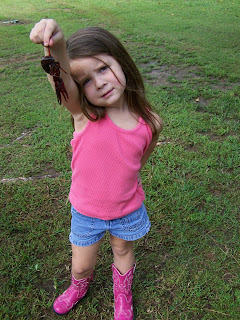 2) Avery found a deceased ladybug in the house and decided to keep it as a pet. She named it Jennifer although she said it was a boy. She carried it around and even took it outside. While up at the garden, she lost the dead ladybug. She began yelling, "Here Jennifer! Where are you Jennifer?" and searched for her for about 10 minutes. Jennifer, the deceased ladybug, was never found. 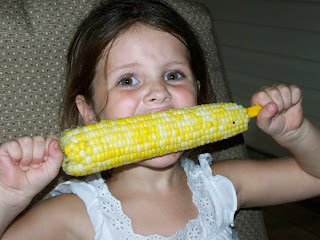 3) Something ate the corn in our garden. Two thirds of the corn was stripped back and eaten completely. Joe thinks it was raccoons. He was very upset and kept saying, "Something (animal) is going down!" which Avery found fun to repeat the rest of the night. Joe then rigged lights around the garden and prepared to "take down" the thief. 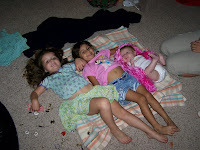 4) I went to Wal-Mart after the girls were good and asleep. I got there at about 10:45. I couldn't believe how many people were there! Mostly college kids and teenagers. A LOT OF STRANGE PEOPLE come out at night to go to Wal-Mart. I was very glad to get out of there! 5) After I left Wal-Mart I rewarded myself for being such a trooper, and Joe for staying with the girls, and indulged in some Andy's frozen custard -- peanut butter shake (thanks Amy B!) and a raspberry concrete! A wonderful snack for late at night (their open until 12:00 in the summer)! Another wonderful thing about my husband, Joe, that some people may not know is that he is a terrific gardener! We have a large garden with 5 rows of corn, 2 rows of squash, 1 row of tomatoes, 1 row of various types of peppers, and 2 rows of cantaloupe. Joe plants, hoes, tills, waters, and picks the garden all by himself this year -- with a little help from Avery. With Addison being 3 months old, I am no help at all. Last night, we had our first harvest of the season. I tell ya, there is nothing like fresh corn! Avery LOVES it! Along with the corn, my amazing husband also cooked fried green tomatoes, baked squash, and grilled pork chops. It was a fantastic meal. We sat outside on the deck and feasted on our home grown (sans the pig) meal.